We all have those days. The kids had sports practice at two different locations after school. Your boss assigned a new project at the office, and all of the responsibility fell on your shoulders. The house is a mess, and you have in-laws coming into town for a weekend visit. Talk about stress! Although life’s stressors cannot be avoided, there may be a way for you to create an escape where you can relax and unwind after a long day. Cue a utility storage shed in your backyard that you can convert into the latest DIY project: The She Shed*. Is the concept of a outdoor storage She Shed new to you? Well, it’s basically the same idea as the infamous Man Cave. Replace the big-screen televisions, sports bars, and pool tables for your very own coffee or wine bar, yoga mats, a massage chair or comfy couch, a diffuser, a garden and herb wall and perhaps a shelf full of your favorite books and magazines. Creating your own She Shed oasis with a mini barn, gable or custom outdoor storage building from Barnyard Utility Buildings is the perfect way to take care of yourself both before and after a long, tiresome day. Not all She Sheds are created equal. If you are looking for a durable utility storage shed that you can turn into a tranquil space of your own, a mini barn or gable from Barnyard Utility Buildings, depending on your custom specifications and aesthetic taste, is the way to go. We offer women looking to design their own she sheds quality utility buildings that are constructed with the same materials used to build houses. From the foundation to the walls to the roof, your Barnyard utility storage shed or mini barn is guaranteed to be the sturdiest, highest-quality structure on the market. You can easily relax in your She Shed knowing that your converted outdoor storage building is covered not only by a five-year workmanship warranty, but also numerous other manufacturers’ warranties. Cheers to that! So, you have decided to make the leap, and create your own She Shed—excellent! Now, it is time to decide what size of utility building gable or mini barn you want. If you are looking for a quiet space outside of the house where you can practice yoga in solitude while breathing in some relaxing lavender essential oils from your diffuser, one of our standard 8’ x 8’ floor plans may be the best fit for you. However, if you want to have a She Shed complete with a couch, television, massage chair, and a coffee or wine bar where your girlfriends can gather on Friday nights, Barnyard Utility Buildings offers a larger standard floor plan that measures 16’ x 24’. If you think your She Shed may need to be somewhere between our smallest and largest floor plan sizes, you can design your own gable or mini barn dimensions with the help of our team. Barnyard Utility Buildings can help you customize your She Shed to meet your exact requirements. After determining your She Shed’s size, you can further customize your outdoor oasis with features like porches and gables. These add-ons give your converted utility storage building a classic look that is popular among those ladies living in neighborhoods where home and shed exteriors must match. Gables go over well with most neighborhood associations and are the most popular choice for She Sheds due to the classic A-frame roof lines that provide your she shed with an extra element of class and architectural intrigue. This additional feature is generally pleasing to the eye, and is a timeless add-on that will remain relevant for years to come. Along with gables, adding a porch onto your She Shed gives you extra outdoor space where you can relax with a cup of tea and the latest fitness, fashion, or gardening magazine. You can even add an overhang to your She Shed, which lets you utilize your porch in both rain and shine. Speaking of gardening magazines, you can even brighten up the exterior of your She Shed by adding hanging window box planters or planting your dream garden around your converted utility building gable or mini barn. Imagine sitting on your She Shed’s porch surrounded by the scent of fresh flowers on a sunny day. This oasis is easily attainable, and can help bring the vision that you have for your backyard to life. We all need some time at the beginning or end of the day to decompress or simply, some space for “me time” amidst the busy nature of life. For that reason alone, She Sheds are important additions to your backyard and can transform your lifestyle. These tranquil escapes allow you to create your own at-home oasis where you can rejuvenate and reflect. 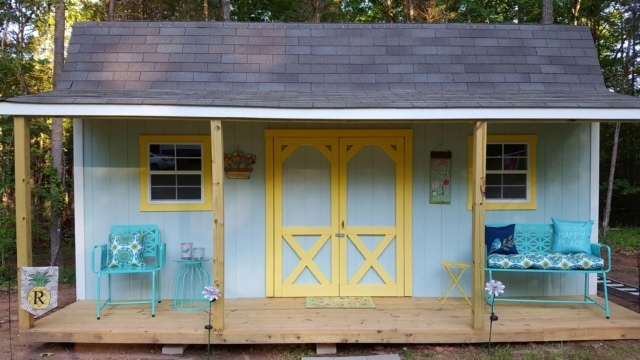 Designing your own custom utility building or mini barn that you can convert into a she shed has never been simpler, and in the world of Pinterest and Instagram, design inspiration is endless. Let Barnyard Utility Buildings help you construct your perfect She Shed, and rest easy knowing that your backyard escape will last for years to come. Visit a Barnyard Utility Building locations near you across the Carolina’s or give us a call to learn more about customizing your outdoor storage building into a She Shed!